The Media is often white in color, pleated, and fabric-like in appearance. All the water passes through and the media catches the debris. The material used to make the fabric is spun bound polyester, formed into a cloth-like material, which is then pleated. The Core is the internal structure of the filter which give the filter strength from the force of the water flow. If the core is not strong enough to maintain the integrity of the filter, the water flow is mitigated. The End Caps are the plastic material at the end that keeps the integrity and attaches the filter to the plumbing of the spa. End caps all will have an opening, many have two, and many have a threaded end or a slip-like attachment. The Media is ripped, bent or imploded it’s time to replace them. The End Caps on the end are brittle, cracked, or very discolored. 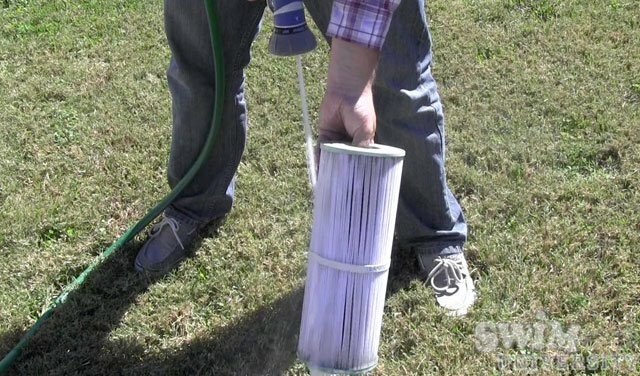 Cleaning your filters will help you get the maximum life expectancy out of them. The following are all acceptable spa filter cleaning methods. But depending on the length of time, you can do a different method. TIP: buy two sets of hot tub filters. While you’re cleaning one set, the other can be used in the hot tub. Remove the filters from your hot tub and give them a quick rinse with water. You can rinse them with a garden hose or in a sink. Be sure to spread apart each pleat and rinse well between them to get any dirt, hair, or other debris out. Once you have completed your rinse, allow the filter to dry before using in your hot tub. Purchase a bottle of hot tub filter cleaner. If you already have filter cleaner, and it doesn’t come in a spray bottle, use the recommended dilution method for the cleaner and put it in a clean spray bottle. Generously spray down your hot tub filters and let them sit for about 15 minutes. Then, rinse them down with clean water. NOTE: Make sure you rinse them down really good. Filter cleaners can cause a ton of foam in your tub when you put the filters back in. 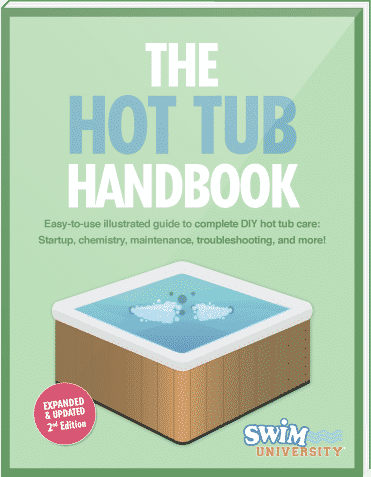 You should change the water in your hot tub every three to four months. At this point you should also take the time to do a thorough cleaning of your filter. Using a hot tub filter cleaning chemical (NOTE: do not use household products), dilute the chemical with water according to the directions on the bottle. Make sure you use enough water to completely submerge one filter. If you have room, you can add more filters to the solution. Let the filter rest in the solution overnight or 24 hours. The next day, be sure to rinse the heck of the filters with clean water. Again, you don’t want foamy hot tub water. Quick Rinse your hot tub filters with clean water every week. This will help keep the debris from building up and the chemicals from eating away at your filter material. By doing this, you will allow your hot tub filters to work more efficiently and last longer. Chemical Rinse your filters using a standard filter cleaner every month. Spray the filters down with the cleaner and let them sit for about 15 minutes. This will allow the chemical to sink and do its job. Then with clean water, rinse the filter thoroughly until all the soapy substance is gone. Chemical Soak your spa filters overnight every 3-4 months. 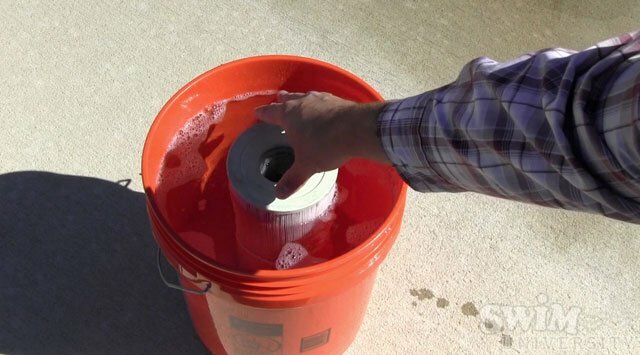 Some pool and hot tub supply stores might offer this service, but it’s really easy to do at home with a 5-gallon plastic bucket and some hot tub filter cleaner. 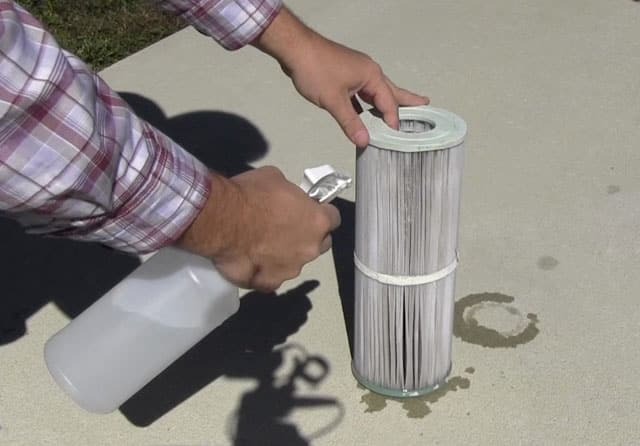 You should effectively clean your filter(s) so it doesn’t damage them. Get the most life you can out of it before you have to change it. While bleach is a great cleaner for many different things, do not use it on your filter. Sure it will come out sparkling clean, but the bleach will damage the fibers greatly reducing the life of the filter. While household cleaners are great, avoid using them on your spa filter. If you do use them, you could find that you end up having to deal with a major foam problem in your spa. While that filter may seem perfect for the dishwasher, do not use it. Yes it will come out looking very clean, the powerful wash will degrade the fibers reducing the effectiveness of the filter. On top of your water care, you need to take care of the parts of your spa that are responsible for cleaning the water on a regular basis. Your hot tub filter cartridge takes a beating all the time, especially if you enjoy regular soaks. By cleaning it, you can make sure that your filter cartridge will last longer and your water remains clean so you can enjoy your hot tub whenever you are ready for a soak.